Startrails created from 14 photos (2 minutes of exposure). English : Startrails created from 14 photos (2 minutes of exposure). English : Mud pool near Waiotapu, south of Rotorua, New Zealand. Union Pacific 844 at Painted Rocks, Nevada, on a run from Elko to Sparks, Nevada, September 15, 2009. 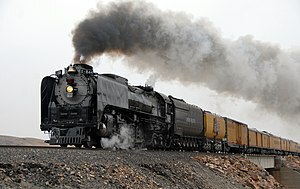 English : Union Pacific 844 at Painted Rocks, Nevada, on a run from Elko to Sparks, Nevada, September 15, 2009. English : Two males of Hermann's tortoises encounter in natural habitat at San Vincenzo, Tuscany, Italy. The caterpillar of Ardices canescens eating a Japanese pumpkin leaf in suburban Sydney, NSW, Australia. English : The caterpillar of Ardices canescens eating a Japanese pumpkin leaf in suburban Sydney, NSW, Australia. English : "Goeldi's monkey" (Callimico goeldii) at Universeum, Gothenburg, Sweden. Jefferson Memorial seen across the Tidal Basin at dusk in Washington, D.C., USA. 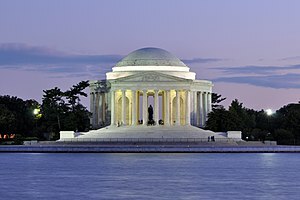 English : Jefferson Memorial seen across the Tidal Basin at dusk in Washington, D.C., USA. English : Fireworks from 4 July 2011 in Salt Lake City, Utah for United States Independence Day (23m 31s). English : Diwan-i-Aam is a large pavilion for public imperial audiences with an ornate throne-balcony (jharokha) for the emperor. It is located in the walled city of Old Delhi (in present day Delhi, India). English : 20 seconds of a desktop split-flap clock (19s). A hot air balloon being inflated before air trip over Cappadocia, central Turkey, as seen from inside..
English : A hot air balloon being inflated before air trip over Cappadocia, central Turkey, as seen from inside..
English : One lap of the ferris wheel Pariserhjulet at Liseberg, Gothenburg, Sweden. English : Cueva de los Verdes, Canary Islands, Spain. Reflection on water. English : Rivellia syngenesiae is a member of the signal flies (Platystomatidae) and widespread in Europe and parts of Asia. Southern view of the Laufener Hütte, Salzburg, Austria. English : Southern view of the Laufener Hütte, Salzburg, Austria. English : 70 years ago today, Volcano, the eighth of the 1940s Superman animated Technicolor short films, was released. Michotamia aurata, male. Insects in the Diptera family Asilidae are commonly called robber flies. The family Asilidae contains about 7,100 described species worldwide. Taken at Kadavoor, Kerala, India. English : Michotamia aurata, male. Insects in the Diptera family Asilidae are commonly called robber flies. The family Asilidae contains about 7,100 described species worldwide. Taken at Kadavoor, Kerala, India. 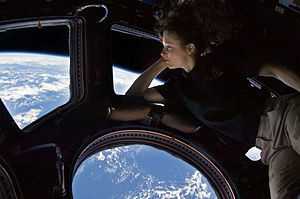 English : Self portrait of Tracy Caldwell Dyson in the Cupola module of the International Space Station observing the Earth below during Expedition 24. English : Australian Wood Ducks grazing at Belair National Park, South Australia. English : The Atacama Dry lake, in Chile. At the horizon, the Licancabur volcano. English : Saint Petersburg Mosque. Maiolica of portal, in the form of Muqarnas. English : Fireworks for Bastille Day in Paris (41s). Portrait of the common wasp Vespula vulgaris depicting the characteristic head markings. English : Portrait of the common wasp Vespula vulgaris depicting the characteristic head markings. English : Video from pushing of coke at a German coke plant, filmed from the pushing car. You can feel the power needed to push the coke by the vibration to be recognised on this video. English : A Hubble Space Telescope image of the R136 super star cluster, near the center of the 30 Doradus Nebula, also known as the Tarantula Nebula or NGC 2070. English : Russian Polikarpov I-16 start-up and fly-by at Paine Field USA Sept 2011 with sound - includes mock attack on bi-wing. A lonely house. An image made using Blender 3D. 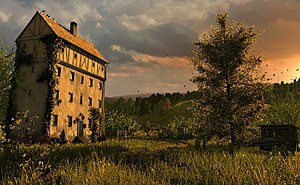 English : A lonely house. An image made using Blender 3D. English : Cockpit view of an LC-130 approach and landing on the Seasonal Ice Runway at McMurdo Station, Antarctica. One of the Maid of the Mist tour boats approaching the Horseshoe Falls on the Canadian side of Niagara Falls. English : One of the Maid of the Mist tour boats approaching the Horseshoe Falls on the Canadian side of Niagara Falls. English : Driving on San Jose roads. Grandidier’s Baobab, picture taken near Morondava, Madagascar. English : Grandidier’s Baobab, picture taken near Morondava, Madagascar. English : In 2011, the final mission of the 30-year space shuttle program touched down at NASA's Kennedy Space Center. English : Castle Neuschwanstein, Bavaria, Germany. Inflorescence of a Crown Daisy (Glebionis coronaria) showing the two types of florets. English : Inflorescence of a Crown Daisy (Glebionis coronaria) showing the two types of florets. English : This is a visualization of US expansion in North America from 1700 to 1900, seen through changes in the spatial distribution of post offices . El Golfo Beach in Lanzarote, Canary Islands (Spain). English : El Golfo Beach in Lanzarote, Canary Islands (Spain). English : This video shows the motion of Pluto's five satellites as photographed by the Hubble Space Telescope on July 7, 2012. The three-exposure-time-lapse sequence spans a total of 4.5 hours. The images were taken with Hubble's Wide Field Camera 3 in visible light. English : Greater Flameback (Chrysocolaptes lucidus), Kaeng Krachan, Phetchaburi, Thailand. The most prominent call in the recording is a second Greater Flameback. English : Ballet dancer Michaela DePrince at a photoshoot for Teen Vogue magazine. London, host city of the 2012 Summer Olympics. English : London, host city of the 2012 Summer Olympics. Red deer (Cervus elaphus), in Freyr forest, near Han-sur-Lesse, Belgium. 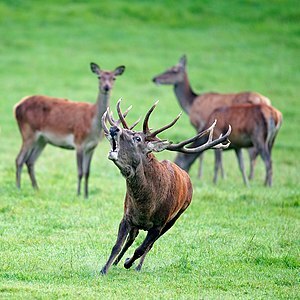 English : Red deer (Cervus elaphus), in Freyr forest, near Han-sur-Lesse, Belgium. Himeji Castle, Himeji, Hyogo Prefecture, Japan. English : Himeji Castle, Himeji, Hyogo Prefecture, Japan. Leucistic Jackdaw (Corvus monedula) with strange white feathers in Naantali cemetery, Naantali, Finland. English : Leucistic Jackdaw (Corvus monedula) with strange white feathers in Naantali cemetery, Naantali, Finland. Crimson Marsh Glider (Trithemis aurora) is a species of dragonfly in the family Libellulidae. Taken at Kadavoor, Kerala, India. English : Crimson Marsh Glider (Trithemis aurora) is a species of dragonfly in the family Libellulidae. Taken at Kadavoor, Kerala, India. English : Southern Skimmers (Orthetrum brunneum) in copula. Filmed at the Wollenberg, Hesse, Germany. This page was last edited on 27 May 2011, at 17:51.